today I bring even more plates showing the fashions that were popular in 1829. Enjoy! A dress of white striped gauze, over pink satin: the body a la Grecque, with short sleeves, edged round the arm with narrow blond: the border of the dress is of gauze, bouillone, headed by a white satin rouleau and fan ornaments, surmounded each by a puff, en ballon. The head dress consists of a hat of blue satin, ornamented with two tails of the Bird-of-Paradise. 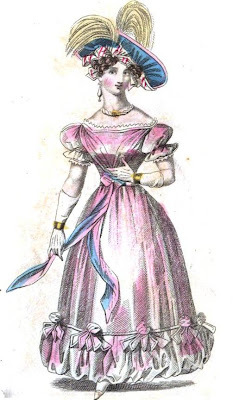 A sash is worn round the waist, of blue and pink ribbon, tying in front with long ends. The necklace is of pearls, fastened in front by a medallion— brooch of rubies. The ear-pendants of wrought gold, and very broad bracelets of the same. A round high dress of fine merino, the color of the marshmallow: one deep flounce, edged and headed by deep rouleaux of the same color in satin, forms the border of the skirt. 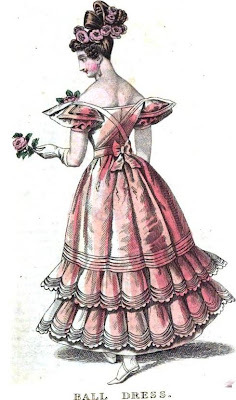 The body is made plain, and buttons down in front by a row of buttons, set very close together; and the waist is encircled by a pointed zone. The sleeves are en gigot, with double cleft mancherons, and a gauntlet cuff at the wrists. A double ruff of lace is worn round the throat, fastened in front by a bow of colored ribbon. Over a blond cornette is a bonnet of black velvet, trimmed with black and blue ribbon. A dress of lilac gros de Naples, with one broad flounce, edged with a slight pattern of black embroidery: the body en gerbe. 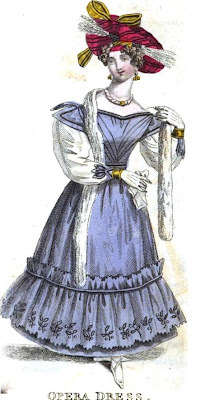 Long white crape sleeves, en gigot, over which are cleft mancherons of lilac silk; an ornament, en fleurs de lis of the same material, is placed on the outside of the wrist; and a very broad bracelet of gold confines the sleeve next the hand. Spanish velvet toque of ponceau velvet, striped with black, and ornamented with gold bows and tassels. Ear-pendants of gold, en girandoles, and necklace formed of twisted rows of pearls, fastened in front with a brooch of wrought gold. A white swan’s-down long tippet is thrown over this dress. A pelisse of lapis-blue gros de Naples fastened down the front by rosettes of ribbon, of the color: the body finished by fichu robings, en gerimpe, and the collar surmounted by a narrow ruff of lace, tied in front by a rosette of ribbon: sleeves, en gigot. 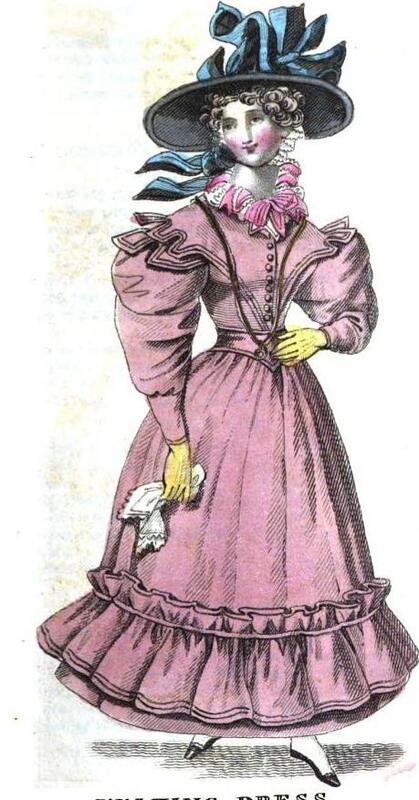 Black satin hat, with yellow and pink ribbons; and fastened with by a mentonniere of blond under the chin. A pelisse of fawn-colored satin, fastened down the front of the skirt by gilt buckles. The sleeves, en gigot, confined at the wrist by a broad gold bracelet. The throat encircled by a ruff of fine lace, tied in front with blue ribbon. A small blond cornette is worn under a hat of gros de Naples, the color either pale pink, or straw color; this is tastefully trimmed with blue satin and yellow esprit feathers; and a veil of clear white striped gauze is worn over the face. 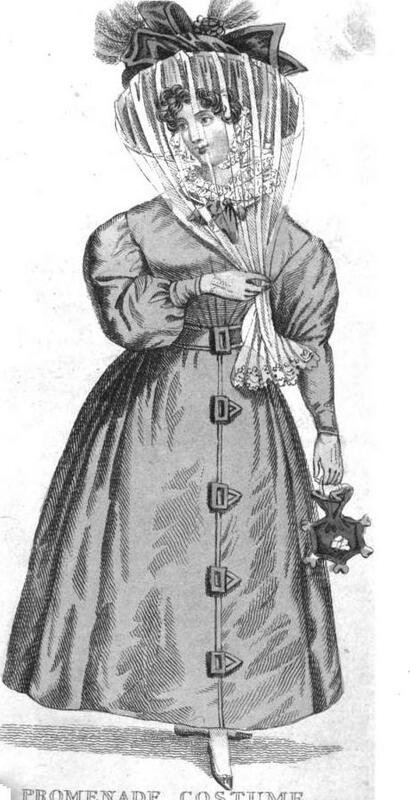 A Chinese reticule is carried in the left hand, of blue satin, ornamented with white silk cordon, tassels, inc.
Over a white satin slip, a dress of apricot-colored crepe Aerophane; two flounces, scallopped at the edges, ornament the border, the scallops finished by three rows of dark purple or apricot-colored satin, in bias-rouleau binding, and the upper flounce surmounted by three narrow dark purple or apricot-colored satin rouleaux: the sleeves short, and very full, with cleft mancherons: the body is made plain, and over it are Iberian bracers of apricot-colored satin, with a belt of the same, encircling the waist, finished by a rosette behind, with very short ends. The hair arranged in light curls next the face, and bows of hair on the summit of the head, ornamented by a wreath of large full-blown Provence roses. What do you think of these dresses? Love them? Hate them?